Our team in Ghana has been conducting outreach to the Central region of Ghana towns to re-connect with old patients and identify new patients. 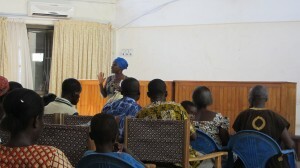 They chose the Cape Coast region because they saw the available data and some patients hailed from the region. Nana Akua Owusu is one of two Speech and Language Therapists with the Transforming Faces Project in Ghana. She can speak the local language, so they decided on this as the pilot outreach project. The first outreach camp took place in November 2012. They linked with the regional health authority which helped to run ads on tv and radio. One new patient was identified and follow up was provided to three patients. The team consisted of a Speech and Language Therapist, a Junior Doctor from the Plastic and Burns Dept, two nurses, the Administrator and Co-ordinatot as well as three members from TFW. During the second outreach trip, which was made up of a Senior nurse and the Speech Therapist, they targeted those who were already on their list rather than broadcast it using the media. Six children showed up with their family. Each family first saw the Nurse for approximately 20 minutes. She examined them, checked on any outstanding issues and provided counselling where necessary. Only 1 of the six, who were all in school, was not ready for therapy because his surgery had not yet been done. Nana was able to spend about 45 minutes with each patient and provide them with specific speech/articulation work and a homework sheet where they can track their progress to be reviewed at the next visit. The team hopes to conduct outreach trips every 5 weeks. In the meantime, a PACT Trainee from Ghana is able to see patients living close to Korle-Bu hospital in Accra, while Mr Amihere, the other Speech Therapist on the team also sees patients South of Accra at his clinic. Nana operates a private clinic in the North of Accra and sees patients living in that vicinity. Between them, she hopes to reach a wide array of patients. Speech therapy is needed – especially by school age kids. Even within the Central Region, there are some who cannot travel to Cape Coast for therapy. The team is investigating different methods that they can use for follow up. Stay tuned for more from our team in Ghana!